You'll visit kid-friendly attractions like Dolphin & Whale Watching and Adventure World Perth Australia. 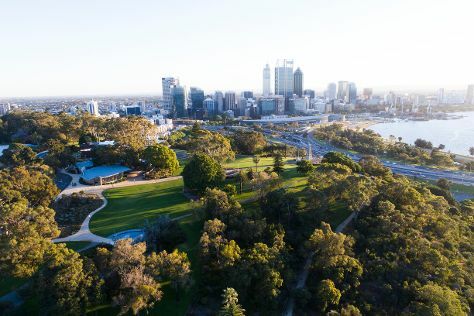 Explore Perth's surroundings by going to Penguin Island (in Rockingham), Fremantle (Fremantle Markets & Fremantle Prison) and Caversham Wildlife Park (in Whiteman). Dedicate the 24th (Fri) to wine at some of the top wineries in the area. The adventure continues: admire the natural beauty at Kings Park & Botanic Garden, kick back and relax at Scarborough Beach, appreciate the history behind Kings Park War Memorial, and stroll through Cottesloe Beach. To find maps, where to stay, and other tourist information, use the Perth travel planner. If you are flying in from Australia, the closest major airport is Perth International Airport. January in Perth sees daily highs of 38°C and lows of 20°C at night. Finish your sightseeing early on the 25th (Sat) to allow enough time to travel to Tokyo. Family-friendly places like Tokyo Disneyland and Edo-Tokyo Museum will thrill your kids. Step out of Tokyo to go to Maihama and see Tokyo DisneySea, which is approximately 30 minutes away. There's lots more to do: don't miss a visit to Meiji Jingu Shrine, contemplate in the serene atmosphere at Sensō-ji, get to know the fascinating history of Imperial Palace, and admire the striking features of Tokyo Tower. For photos, where to stay, traveler tips, and other tourist information, go to the Tokyo trip planning tool . You can fly from Perth to Tokyo in 16 hours. Another option is to do a combination of flight and train. The time zone changes from Australian Western Standard Time to Japan Standard Time, which is usually a 1 hour difference. Plan for colder temperatures traveling from Perth in January, with highs in Tokyo at 11°C and lows at 1°C. Finish your sightseeing early on the 31st (Fri) so you can travel back home.